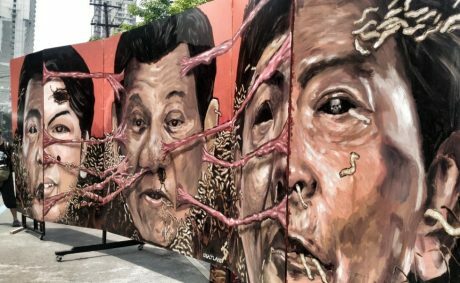 An unhealthy and even morbid fixation on the past is evident in the disturbing imagery used in Filipino protest art. Members of the Philippine Opposition could use some professional therapy. They seem to be suffering from some kind of mental disorder. Their obsession with the late former President Ferdinand Marcos Sr is already disturbing. The way the Opposition use Marcos in their protest rallies and the way they associate him with current President Rodrigo Duterte is as if he is still alive today despite being dead since 1989. Yes, that was almost 30 years ago. One wonders why these people are still haunted by the man who died in exile in the United States. Activists holding up placards with images of Marcos Sr during a recent protest rally to commemorate the 46th anniversary of the declaration of Martial Law were a ridiculous sight. The anti-Marcos protesters are of the belief that nothing good came out of Martial Law. But if you analyse the real situation then, there was a real threat of communist takeover in the Philippines in the 1960s and 70s. One just has to look at the events that transpired in Vietnam at that time to confirm this. While it is right to remember the people who were victims of atrocities committed by rogue members of the law enforcement agencies then, it should be balanced with commending the work of the military and police who remained committed to their duties to protect the republic from communism. The problem is, some of these protesters are communist sympathisers or have been brainwashed into believing that those who died in the hands of the military and police during Martial Law were all “innocent”. While the lead agitators were taunting the police and mouthing anti-US imperialist tirades, Ka Estrel sidled up to me and in a stealthy manner slung on my shoulder a soft, innocent-looking bag made of cloth (backpacks were not yet in vogue at the time), then whispered: “Ganyan ang ginamit sa Plaza Miranda. Pagbunot ng pin, ibato mo agad. Four seconds sasabog yan. (That’s the same kind used in Plaza Miranda. After pulling out the pin, throw it at once. In four seconds it will explode. )” And with that, Ka Estrel made herself scant. Shortly after, those at the front line succeeded in intimidating the policemen, who started charging. Those assigned with pillboxes exploded their weapons at the police onrush. Suffice to say, the protesters during Marcos’s term did not come in peace. They came to maim and hurt innocent people just to prove a point. They were no different to terrorist suicide bombers in the Middle East. These are facts that millennials are refusing to accept. It doesn’t even matter how many previous members of the communist movement like Samonte speak out against their former comrades. They still think that only Marcos was “evil” for declaring Martial Law. Proof that the Opposition is also suffering from tunnel vision is the fact that they only blame Marcos for the supposed atrocities even when former President and former head of the Philippine Constabulary Fidel Ramos oversaw the activities of the police force. He should be held accountable for the alleged atrocities committed by his men. But as long as he is singing praises to the Aquinos, he is safe from condemnation and persecution from the Opposition particularly the anti-Marcos advocates. Ramos sure won’t suffer the same fate as former Senator and former Marcos Secretary of National Defense Juan Ponce Enrile. Enrile was a key player in the ousting of Marcos Sr in the 1986 so-called People Power revolution, but has had a falling out with the Opposition. They have thrown him under the bus since he has gone past his use-by date and since he has come out with his “real” version of what happened during EDSA that doesn’t paint a good picture of the “victims” of Martial Law. In a one-on-one interview with former Senator Ferdinand “Bongbong” Marcos Jr, Enrile claimed that Marcos forces did not kill anyone because of their political or religious beliefs. He justified the need to declare Martial Law, which included putting an end to the negative propaganda that claimed Marcos ordered the massacre of Muslim trainees in Corregidor Island in 1968 dubbed as the Jabidah massacre, a fabrication created by Ninoy Aquino, as well as the Plaza Miranda bombing in 1971. Following Proclamation 1081, many heaved a sigh of relief. There was order. The streets of Manila were free of the noisy and raucous hordes. There was no fear about walking about in the evening because everyone knew that misbehaviour could have dire consequences. The Opposition who keeps organising these protest rallies are definitely out of touch with reality. They keep hoping to copy the successful ouster of Marcos Sr using people power and wish to use the same style in ousting Duterte who they think is copying Marcos. But the recent failed “people power” revolution to oust Duterte only means one thing: the leaders of the Opposition do not have the gravitas to convince the public to join their cause. It doesn’t help that their cause hasn’t evolved and is still stuck in the 1970s. It’s one thing for members of the public to join protest rallies but it is quite another for a public servant to join one. That’s exactly what Senator Risa Hontiveros did during the recent rally. She was videoed heckling Duterte before a crowd of protesters and accusing him of destabilising democracy. She was a disgrace. She is already a lawmaker and should be using her post to effect the changes she wants done. If she doesn’t have ideas for the legislature anymore, then she should simply resign and become a full time protester. She is useless as a Senator because she doesn’t use her post to write or amend laws that can help Philippine society. 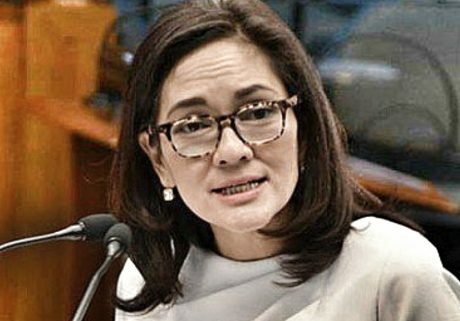 Hontiveros is the one who doesn’t understand how democracy works. She doesn’t understand change in a democracy is slow because every policy or idea has to run past different branches of government. One simply cannot implement one’s ideas without approval from Congress and the Executive. Paid to legislate or paid to rally? Senator Risa Hontiveros may need a bit of help understanding her job description. People like Risa Hontiveros do not have any legal means of getting rid of Duterte so they just use their position to taint his image before a gullible crowd. They claim to be advocates of human rights but deprive their enemies of right to due process. They are inconsistent. It is 2018, but the members of the Opposition still think a dead man still poses a threat to them. This paranoia is the result of feeling powerless and not being in control of their destiny. If they are afraid of Marcos Jr, then it only means they have no faith in Philippine society. There is no one else to blame for that other than the people who were in charge after Marcos left the building. Rita Hontivirus, is a crook, with PhilHealth scandals looming on her. The opposition knows nothing but rallies, blame games, and sowing chaos on the country. They have no programs to present to us, to improve our lives and our country. All they do is to point to the problems, but have no solutions for the present problems. And they want their power back ! the yellow congressmen and senators isn’t afraid about the truth to come out during martial law. They’re too scared that one of these days to come the government will ask them where their pork barrels went. and if they can’t show where it’s been used the government might tell them to return it to the people. That’s the reason i think why they’re too noisy to gain back their lost dynasty. Ohhhhh Mmmmmm Geeee !!! The Yellows cannot show proof how they ate their pork … Bet those pork got plenty of fats …. tie a yellow ribbon round an old oak tree …. A documentary film depicting the brutality & the destruction brought about by the communist movements or the direct results of the military campaigns against them in Laos, Cambodia, Myanmar, Vietnam, Indonesia & Malaysia or the Philippines must be made and be shown to the Filipinos- especially in some left-leaning educational institutions like UP so that people will understand why PP1081 had to be done, placing the entire Philippines nation under martial law. Because without it, Philippines would have been like Laos, completely destroyed by the US relentless air-bombings just to save it from the Communists! The Philippines was dearer to the USA than Laos, just imagine how things would have been worst, had the Communists gotten control of the Philippines in the 1970s. The Philippine was the most significant ally of the USA then, it would been far worse than Laos if the communists got the upper hand as the US military would do everything on its power to protect the Philippines. Imagine the destruction my dear millennials, imagine! Hi GRP, off topic but related to the GRP website: I wanted to send some articles to a web archiving website (web.archive.org) but the comments don’t show because they are hidden under the Load Comments java script button. I hope I can include the comments as well as a lot of them are full of insights. Thanks. Hi, I’ll see what I can do. Thanks for your interest in our work!